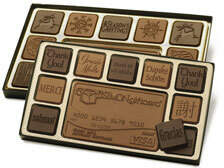 A chocolate gift that cheers up all recipients! This assortment consists of a customized chocolate bar measuring 3” x 5”, and this centerpiece is enclosed by 18 alternating Belgian milk and dark chocolate squares. The squares show a regular motif such as Thank You or Holiday greetings, or may be made to carry your customized design.